If you’re a smoker or if you live with one, you know how difficult it is to eliminate the lingering smell of cigarettes. One thing that really makes a difference is an air purifier. Plus, an air purifier can get rid of bacteria, allergens, dust, and any other household odors. We researched some of the best ones around and put together this review to help you find one for your home. First, here are some key things to keep in mind. 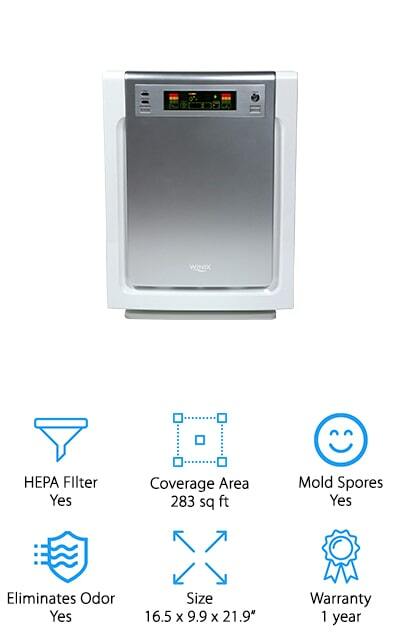 HEPA Filter: HEPA filters are the gold standard. They have to trap 99.97% of particles to have an official HEPA serial number assigned to them. HEPA-like filters are good but usually only capture about 90% of particles. Coverage Area: This is the maximum amount of coverage area for each filter. They range from 167 square feet all the way up to 540. Using the right size is very important for effective filtration. 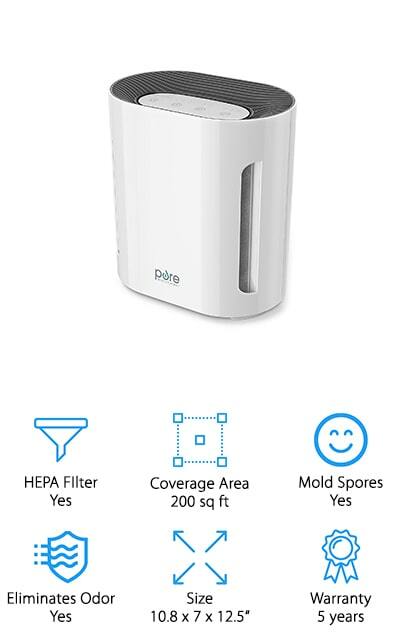 Removes Mold Spores: If you have mold growing, air purifiers won’t kill the mold at its source but they will prevent spores from circulating. This can slow down growth and, more importantly, help keep you healthy. Eliminates Odor: This is the most important thing to consider if your main purpose for wanting an air purifier is to eliminate lingering smoke odor from your home. Usually, a carbon filter is necessary to trap smoke and other bad smells. Size: Sizes vary a bit from small portable options to large floor models. It helps if you have some idea of where you plan to put your machine so you know how much space you have for it. Warranty: As always, warranties are important. All of these products are covered and the range from 1 to 5 years. Make sure you read the fine print so you know what’s covered and, just as importantly, what isn’t. Now that you know the important features to look for, let’s move into our best air purifier for smokers review. Here’s how it works. Our top and budget picks are right at the top of the list. If you’re in a hurry, that’s the best place to start to get an idea of the range that’s available. Stick around if you can, though, you never know which one of our picks will catch your eye. Ready? Let’s get to it. Our top pick for the best room air purifier for smoke is the Blue Pure 211+ Air Purifier. One of the best things about it is the user-friendly design. Get this, there’s only 1 button to cycle through the 3 different fan speeds. The filter uses a 3-stage process that consists of a pre-filter to capture big particles like dust and a layer of particle filtration and an activated carbon filter to get every contaminant out of the air, regardless of size. 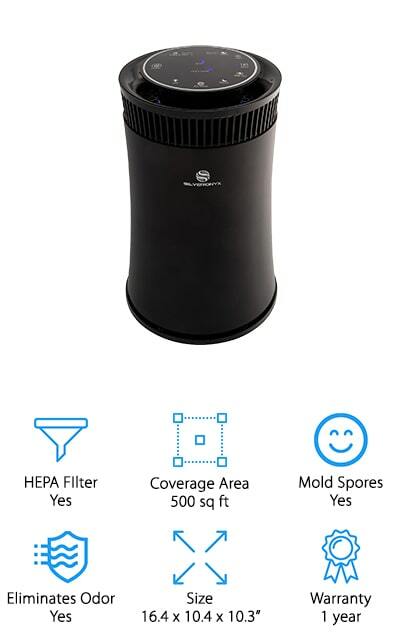 Not only can this air purifier get rid of bad smells like smoke and pet odor, but it also eliminates mold spores, bacteria, and allergens from the air. This machine is rated for medium sized rooms between 400 and 600 square feet. For an air purifier on a budget, take a look at the PureZOne UV-C Air Sanitizer. 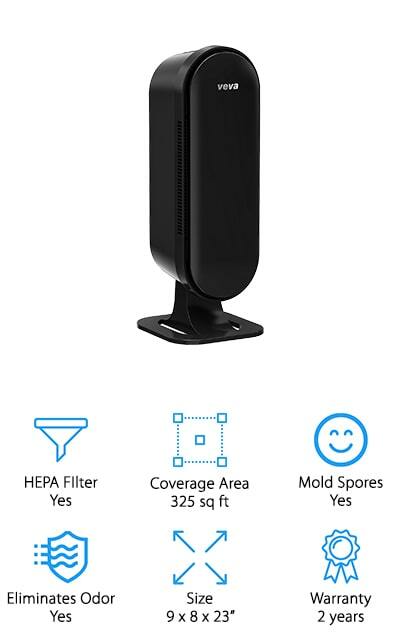 In addition to being effective at eliminating the smell of smoke, this air purifier also has a HEPA filter to remove dust, pollen, mold spores, and pet dander from the air. That’s not all, the UV-C light also destroys micro-organisms like bacteria and other germs, ensuring that they will never be recirculated throughout your home. This machine operated very quietly and features an automatic timer mode that can automatically turn it off after 2, 4, or 8 hours of continuous operation. There are 3 different fan speeds to choose from and the filter reset indicator lets you know when it’s time to swap in a new one. Next up is the Winix Pet True Air Cleaner. One of the reasons this is such an effective product is that it uses 5 stages of filtration in all. 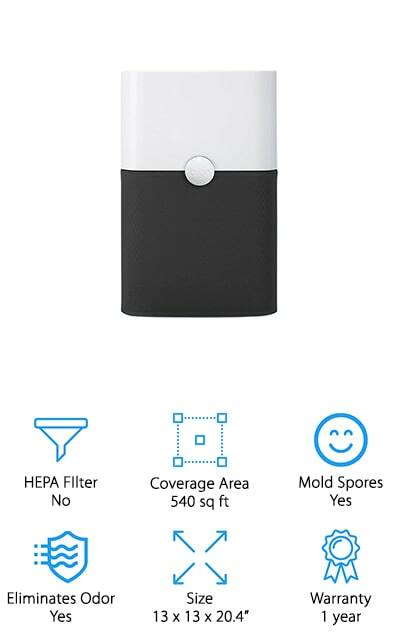 They include a true HEPA filter that captures 99.99% of contaminants in the air including pet dander and other allergens as well as an odor control carbon filter that captures the smell of smoke as well as pet odors. A washable pre-filter was designed to help extend the life of the filtration system by capturing large particles like dust and pet hair from getting to the finer filters and clogging them up. One more thing, this machine actually has smart sensors that adjust the settings according to the odor and dust particles in the air. 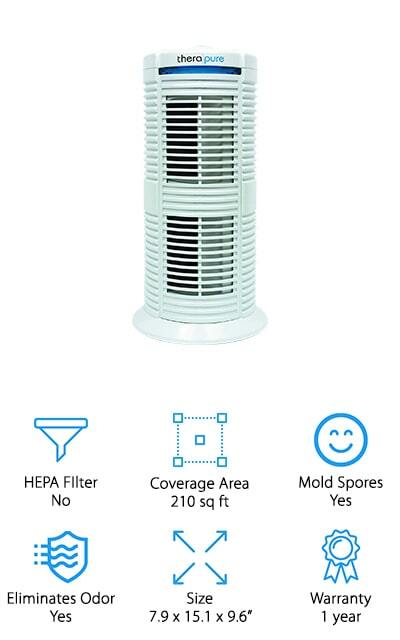 The VEVA 8000 Air Purifier is our pick for the best air purifier for mold. 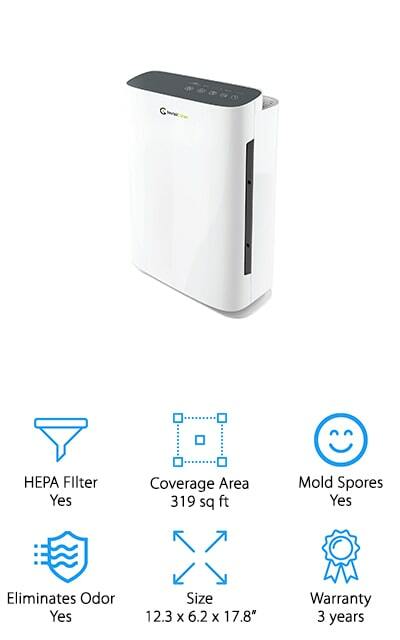 It uses a true HEPA filter to capture even the smallest contaminants. In addition to taking care of airborne mold spores, it also eliminates allergens and germs. Activated charcoal filter media eliminates smoke and pet odors, too. Replacement VEVA filters are inexpensive and they’re designed to last between 6 and 12 months, depending on use and the quality of the air in your home. Another great thing about this air purifier is the sleek, innovative design that makes it great for office use, too. With 3 fan speeds, you can choose from a quiet, energy efficient option or turn on the Turbo power for the quickest, most effective cleaning. For the best air purifier for smoke and pets, it’s tough to beat the GermGuardian Air Purifier. 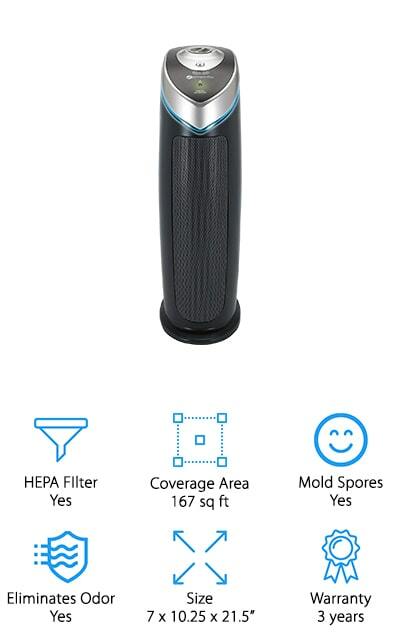 With a HEPA filter for reducing allergens, dust, mold spores, and pet dander plus a charcoal filter to get rid of odors from smoking, cooking, or pets, this air purifier gets a lot of contaminants out of the air. Plus, there’s an option UV-C light that you can use to help reduce airborne bacteria and other germs. If you’re looking for something for a small room, this is a perfect choice. It covers a room up to 167 square feet so you aren’t stuck using something that’s too big. The filters last about 6 to 8 months and there are multi-packs of replacement filters available that are very reasonably priced. This air purifier from Oregon Scientific is one of the fastest ones available. How does it do it? With 4-side air intake system to circulate air quickly and effectively. The filtration system consists of a pre-filter to capture large particles like dust and hair. Then, the air travels through an activated carbon filter and a HEPA filter to remove pet dander and other allergens as well as, you guessed it, smoke odor. There’s also an optional UVC light that kills the bacteria that’s been captured in the filter so you don’t have to worry about it recirculating. Despite how powerful it is, it’s still super quiet and won’t bother you while you sleep. It also features an automatic timer that will turn off after 2, 4, or 8 hours. Our next pick is the InvisiClean Aura Purifier. Something that really stands out about this one is how energy efficient it is. It actually delivers twice the air output using only 82% of the electricity of comparable machines. How does it work? It uses a powerful DC motor that’s much stronger than the AC motors used in comparable machines. 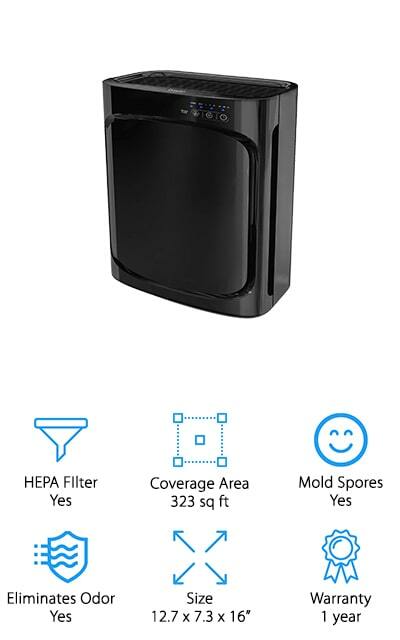 The pre-filter activated carbon and HEPA filter eliminate everything from allergens, bacteria, and smoke odor from the air. There’s also an optional ionizer and disinfecting UV-C light for additional protection. Choose from multiple speed settings for quiet operation or set it to turbo to get the air clean, fast. One more thing, it’s also small enough that you can easily move it from room to room. The Envion Therapure Air Purifier uses a 3-in-1 process to get rid of mold spores, germs, bacteria, pet dander, and smoke odors. The thing that stands out the most about this one is that it has a reusable filter. That’s right, you never have to worry about costly replacements. All you have to do it remove it and use a vacuum cleaner to clean it. This air purifier also sanitizes and purifies the air using patently UV germicidal technology that prevents bacteria and other germs from being released back into the air. That’s not all, there’s also a Photocatalyst filter that removes dangerous gases, including things like paint fumes or that awful smell in the air after you get new carpeting. Another great option for best air purifier for smoke odor is the SilverOnyx Air Purifier. There are a few things about this one that really set it apart. First of all, it uses 5 different levels of filtration. The combined filtration cartridge includes a mesh pre-filter, HEPA, and activated carbon filter. There’s also a UVC light and ion generator that work to sanitize the air even further. It also has a built-in sensor that adjusts the airflow as needed. The easy-to-use display controls the fan speed, ionizer, and UV-C light, as well as the sensor, timer, and auto mode. It has one of the largest coverage areas of all the products in our review and it comes with a 100% money back guarantee. Last up is the Ivation Air Purifier. 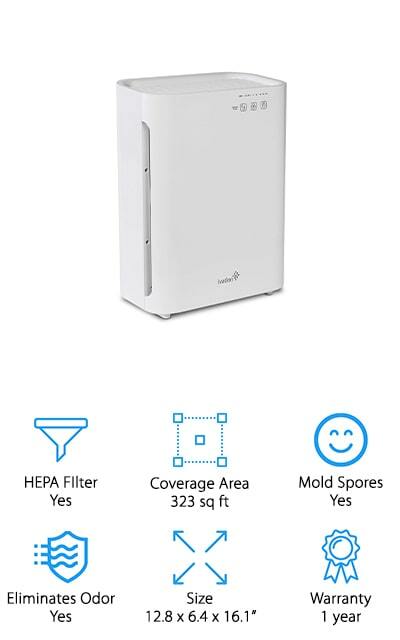 This 3-in-1 system has a pre-filter for large particles and pet hair, a carbon filter to eliminate smoke and other household odors, and a HEPA filter that gets rid of dust, germs, and allergens. There’s also an interior sanitation system that uses UV-C light to destroy any bacteria, mold, or other germs that get trapped in the filter so you don’t have to worry about them recirculating. This machine is really easy to use. It has soft touch controls for power, fan speed, timer, and UV-C and ion settings. This is a really lightweight machine, only weighing about 9 pounds plus there’s also a hidden handle so it’s easy to transport from one room to another as necessary.